A smart idea for your ’board in a user-friendly format. While guitar players may consider a compressor to be a useful link in the tonal chain, some encounter difficulty in setting it up for optimum results. The thing is, you can set a compressor to work in different ways, with two obvious methods standing out: first, for a light compression to keep your rhythm playing consistent, giving a more equal weight to each strum and arpeggio note than you’d achieve without compression; and second, as a boost that adds a little more sustain and smoothness to lead lines. If you want a compressor to do both, you may be ending up with a best-of-both-worlds knob setting that is a bit of a compromise. 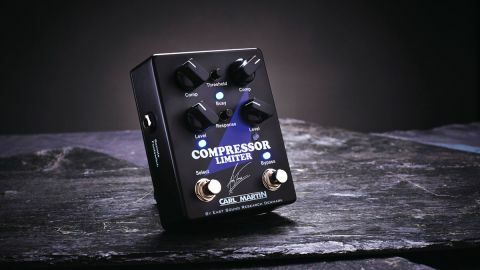 One player aware of those difficulties is Andy Timmons who, with Carl Martin, has come up with an elegant solution to a perennial problem: the Andy Timmons Signature Compressor/Limiter, effectively offering two compressors in one box. This is actually a compressor with two presets, each with its own dedicated knobs for compression and output level and stepped through via a second footswitch adjacent to the pedal’s normal bypass footswitch (you can also do this with an optional remote footswitch if desired). So you can set one preset for heavier compression than the other: one for rhythm; the other for lead. Both presets share the same Threshold and Response settings via 6mm miniature knobs, and while separate knobs for each preset would’ve been the ideal scenario for flexibility, the setup does keep the pedal uncluttered and compact, and it’s easy enough to dial in a setting that works equally well for both channels. There’s a massive range of compression styles available, from a squashed signal and completely reshaped snap at the start of a note, to more transparent dynamics housekeeping. There’s also loads of extra clout via the Level knobs (up to 12dB) for driving your amp. The unique thing, though, is that once you’ve dialled in the basic character of your compression, you can set Comp and Level for two quite different compression/boost outcomes to choose between at will - a real asset on stage. What’s more, you can set the pedal for no compression and use it purely as a booster with two levels of boost.